2. Select ‘Drafts Mailbox’ > ‘On the Server’ > ‘[Gmail] Drafts’. Return to the ‘Advanced’ view. 3. Select ‘Sent Mailbox’ > ‘On the Server’ > ‘[Gmail] Sent Mail’. Return to the ‘Advanced’ view. 4. Select ‘Deleted Mailbox’ > ‘On the Server’ > ‘[Gmail] Trash’. Return to the ‘Advanced’ view. via How-to: Proper Gmail IMAP for iPhone & Apple Mail – Derek Punsalan – 5ThirtyOne. So I was having an issue on my iPhone where my Gmail wasn’t syncing properly. 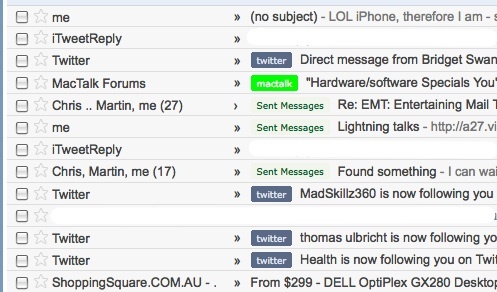 As you can see from the screenie below, each message sent from my iPhone to my Gmail account automatically has the “Sent Messages” label applied to it. Other labels in the screenie below are twitter and mactalk related labels – they’re there purely as examples of labels that are applied as a result of rules. However, this “Sent Messages” label was really bugging me. Whenever I sent email as a reply to my Gmail account from my iPhone, it would automatically apply that “Sent Messages” label to that thread – staying there indefinitely (or until the thread had passed the strange 100-message limit Gmail seems to enforce). I’ve put up with this ever since I got my iPhone, (7 months ago?) but no more. I needed a way for this NOT to happen – thus, Google was my friend. Through extensive Google-fu, I managed to find the above link which demonstrated how to replicate Gmail’s web-client functionality, instead of the iPhone’s apparent lack of a brain when dealing with Gmail’s intuitive “conversation” view of emails. After making my iPhone’s Mail settings reflect the server-side configuration of Gmail (as opposed to it’s own crappy local “Drafts” and “Sent Messages” implementation), my problem went away – as evidenced by the very first message in the above screenshot (I love the iPhone signature! ).